The University of Arizona athletic department aims to spend $378 million over the next 20 years or so to upgrade its sports facilities, officials said Tuesday afternoon. The most comprehensive plan in department history covers 12 major projects. 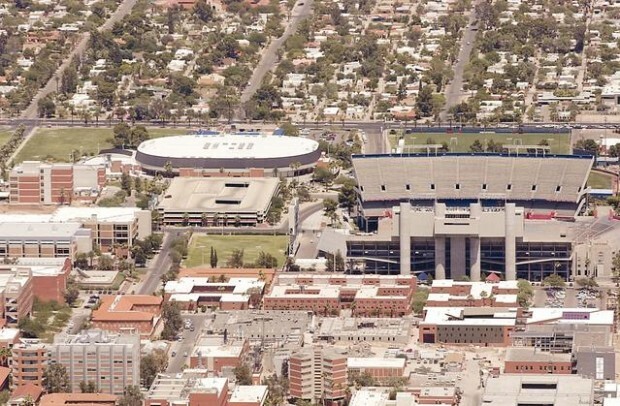 The most prominent are the construction of a building in Arizona Stadium's north end zone and a McKale Center upgrade. The cost, spread out over the next two decades, will be paid for solely with private funds and is pending approval from the Arizona Board of Regents in either December or January, athletic director Jim Livengood said. Arizona Stadium construction could begin after the 2010 football season and be completed two to three years later. Livengood said he is sensitive to the current financial climate, but the projects need to be started. He wouldn't reveal how much money he had raised for the project but said it was "accurate" that the 18-month-old plan would not have come this far without assurances from donors. "The people that say, 'You know, this just doesn't make sense during this time,' I understand that," he said. "My only answer is, it needs to be started. It needs to be thought about, it needs to be worked on." Livengood and senior associate athletic directors Kathleen "Rocky" LaRose and John Perrin revealed the plans at a McKale Center meeting Tuesday in response to repeated public-records requests from the Star. Livengood outlined the plans, with the first step being the $82 million Arizona Stadium project. The centerpiece will be the construction of a four-story, mostly glass building in the area now now occupied by aluminum bleachers in the north end zone. The structure would have about 5,000 premium seats, replacing aluminum benches. The proposed building would house football offices, locker rooms and a public concourse. A new video board would be located in the south end zone. Stadium capacity won't change dramatically, but the department would earn more income from the more expensive seats. "It will certainly be much more income-friendly then our current 4,500 metal bleacher seats," Perrin said. "There's no doubt it will help us." Arizona athletics also wants to acquire Bear Down Field, located behind the north end zone, from another UA department. Artificial turf would be installed for a team training area. Jimenez Practice Field would be expanded, with lighting and drainage improvements. Naming rights to the end-zone building and the stadium itself will be available, Livengood said. Once football offices are moved to Arizona Stadium, McKale Center renovations could begin. A rendering of the renovated McKale Center reveals enclosed concourses that wrap around McKale Center in a proposed $155 million plan. Locker rooms, equipment rooms, showers, offices and lounge areas would be upgraded. The 36-year-old arena would also feature upgraded concessions areas, bathrooms, air conditioning and premium seating. A new gift shop would be located at the south end of Cherry Avenue parking garage. "You're either going to try to play big-league baseball with big-league bats," Livengood said, "or you're going to try to play big-league baseball with Little League bats." Livengood, whose contract expires next year, said he would "love to have the burden" of carrying out the projects in the upcoming years. "But I have no control over that," he said. Most UA teams could receive facility renovations as part of the project. The athletic department consulted with each coach in recent months about their needs. The most recent major department project, the Richard Jefferson Gymnasium, cost $20 million. The basketball and volleyball practice facility, which includes an adjacent diving well, opened last year. Asked whether he thought fans would be upset with him over the $378 million price tag, Livengood tried to distance his future from the discussion. "This project right here, there will be some that I'm sure it will offend the heck out of," he said. "In the end, it's the right thing for Arizona athletics. It really has very little to do with me." Funds not listed will be used for redevelopment and upgrades for other UA athletic facilities.